My husband and I enjoy what we call our splurge breakfasts on the weekends. 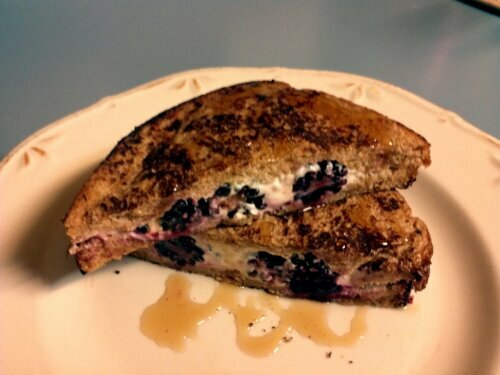 Today was stuffed cream cheese and blackberry french toast. This recipe is simple and easy to make, so a great weekend splurge. Mix flour, almond milk, cinnamon and vanilla in a shallow bowl. Spread cream cheese on two slices of bread, place a handful of blackberries on one slice and fold like a sandwich with the sides with cream cheese touching. Heat one tablespoon of butter in a saute pan, dip both sides of the sandwich in the batter. Place in saute pan and lightly fry each side until golden brown. It cooks quickly, approximately two minutes on each side. Make sure to keep the pan on low to low-medium heat so you will not burn the toast. When done, slice and drizzle with maple syrup and enjoy. Repeat the same steps to make the second stuffed french toast. boy, does that look tasty! I love tofrutti! its great splodged through a lasagna.